My Cat Suddenly Attacks Me, What Can I Do? A: You didn’t mention the age of your cat or if you have other cats in the house. 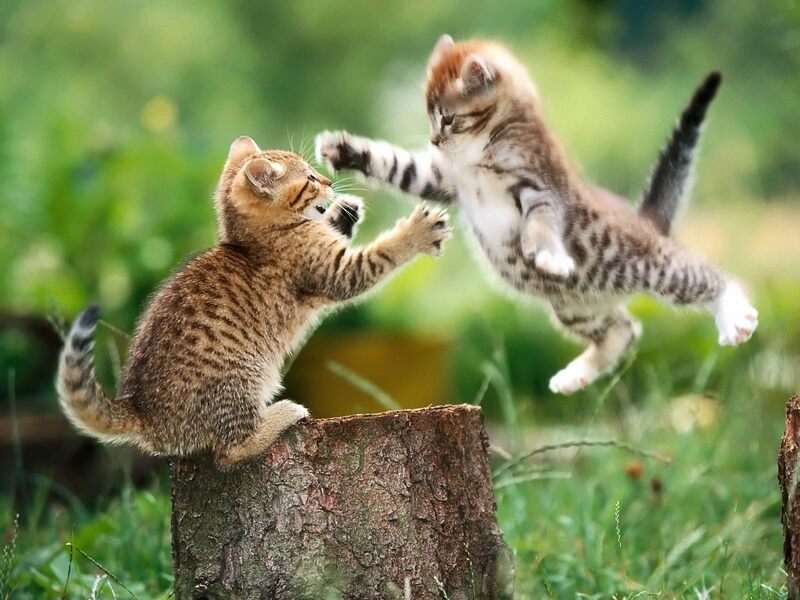 If you are gone during the day and if he is an only cat, there is a good chance it is play aggression. Play aggression is play (from the cat’s perspective) but it is often misdirected onto inappropriate targets or the play can get out of hand. Cats who are raised as singletons (the only cat or animal in the home), cats weaned too early, and cats who are alone a lot frequently can exhibit overzealous play. To the cat, s/he is needing to release pent up energy and feels the need to hunt. Often, these kitties will stalk people or pounce and attack, and then run away. 1) Start playing in a way that stimulates your cat mentally and makes your cat feel good and relaxed afterwards. Cats want to hunt. Most toys are too big for cats and the way we play with cats can leave them feeling pent. When cats hunt, they see a small prey animal, crouch down low (not wanting to be noticed) and then wait for the right time to pounce. They watch the prey and strategize. When the prey animal realizes s/he is being stalked, the animal freezes and/or then tries to flee. This is the time most cats will pounce or go after prey. Prey wants to get away from the cat and hide. When we play with cats often we dangle toys over their heads or swing the toys towards them hoping the cats will jump for the toys or chase toys in midair. This is not the way real prey behaves, which can be frustrating for the cat. Memorize the phrase “Play mimics prey.” Make toys slink or slither away from your cat. Allow your cat to watch the pole, string, or feather. Then stop moving it so it remains still. Your cat will most likely pounce after a few seconds. Allow your cat to play with the toy for a little bit, and then move the toy away from your cat again. Make the toy slither behind a sofa, or hide it under a blanket, pillow, or chair. Once your kitty has captured the toy a few more times, end play with a few treats or a mini-meal. Place the treats down next to the toy and then remove the toy. This will give your kitty a sense of accomplishment. Cats tend to hunt, eat, and sleep. Giving your cat some treats or food after a play session also will signal the end of play. 2) Avoid eye-contact when your cat is in the ‘mood’ to attack. Directly staring at your cat when your cat is pent or locks eyes with you will increase the aggression and can even create the attack. By casually looking away or averting your gaze, your cat will be calmer and many attacks can be prevented. 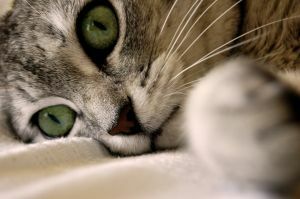 You can also slowly blink at your cat, especially if your cat is nervous or if you have used harsh methods in the past. By relaxing your gaze and giving two or three slow, methodical blinks to your cat (glancing away between each blink), you are telling your cat that you are non-confrontational. 3) Don’t play with your hands. Always use pole toys, feathers, or small stuffed toys when you play with your cat. If you dangle your hands over your cat or encourage your cat to attack your hands, it will be very difficult for your cat to understand how to appropriately play with you. 4) Enrich the environment as best you can so that your cat gets more stimulation during the day. By adding window perches, cat towers and other vertical territory (places for your cat to climb), bird feeders at windows, cat fountains, and soft sleeping areas, your kitty’s environment will be more enjoyable and interesting. This will make your cat more relaxed. 5) No more punishments. Scolding, yelling at, squirting your cat with water, or blowing on your cat will usually make any forms of aggression much worse, or your cat will just become fearful of you. Alana Stevenson can be reached through her website AlanaStevenson.com. She provides consultations by phone and Skype. I have a 6 moth old female kitten who was recently neutered. We rescued her when she was about 15 days old and her mother killed by a car, they were born in the street. When she was around 4 month she started getting angry whe it was time to go to sleep or for the visits to go and she would hold on to my hand really hard biting and sticking her claws, so I would gently pull her away and lock her in a quite dark room for her to calm down. Now, after she was neutered, she does that with more frequence and out of nothing getting really angry towards me (or my hand) and injuring me really bad. I try to hold her from the neck showing my dominance but there’s no calming her down, so I lock her for a bit. The she’ll be calm for a while and might repeat the attitude some couples of times a day… I’m really worried, is it just that she is a kitten, or does she have a problem? Please read these articles to help. If she is the only kitten or ‘singleton’ kitten she is going to need a way to release pent up energy so playing with her appropriately will be very important. If she is ready to latch on or jump and attack you, avoid eye contact (look away from her) and passively move your hand away or engage her away from your hand or body with a toy or a movement such as scratching the corner of the sofa or wiggling a pen on a coffee table. Do not use punishments. Scolding, scruffing and time outs used as corrections will not work and will only make the behaviors worse or damage the relationship you have with your cat. If she was raised without litter mates or other cats, then she does not know how to play appropriately or retract her claws. She is very young. 4 month old kittens will absolutely attack hands and feet. Cats can live to 22 years old, so she is still very young and will be exceptionally curious and playful at 6 months. Cats also tend to grab onto hands when their tummies are touched. My cats ears go back for no reason, she looks at me & attacks my face aggressively! My cat attacked me 5 minutes ago for no reason.She is really sweet but she is 2 years old what should I do? what could be a symptom of rabies. Or why will a 3 year suddenly bite a visit to the house? Hello, my cat isn’t a “singleton”, but rather one of two very playful brothers. They play and run around a lot. SO it doesn’t seem to be pent up aggression. Sometimes when I’m petting him, he’ll rub into me, purrr and all that good stuff, then out of no where he’ll attack my hand or face. I’ll jump up and scream because he has very sharp curved claws that slice easily. The last time he successfully got my face, he scared my nose pretty bad. Anyhow, he will run away, and ‘ll sit there and try to relax and not look at him, but he will attack me anyway, and almost always aim for my face, particularly the eye region. He doesn’t do this often, but it’s scary enough to make me slowly afraid to be affectionate with him. He has no other aggression towards me. He follows me around, sits in my lap and between my legs when I sleep at all other times. But it seems the second I start doing an serious petting or cuddling he get excited, and then aggressive. I’ve thought maybe I should just let him bite my hand and not yelp or something and just refrain from touching him at all and just get up and leave, but he will follow me and then jump up my back and hook his claws into my skin. It’s really horrible. It takes my boyfriend coming into the room for him to ‘heel’ as he calls it. My cat does this too. He is a 7 month old neutered siberian kitten. He seeks me out and comes and sits on my knee and will lick my hands or my face and will sleep for maybe ten minutes. He will be extremely affectionate and then he starts to attack my hands. I take him off me and put him down, I have said ‘ouch’ loudly as recommended in the book how to raise a well adjusted cat and I have walked away from him also recommended, BUT then he will jump at me and bite. If I ignore him he comes after me and will jump at my head and bite. He has bitten me in the back of the head and drawn blood. Interestingly he does not use his claws on me. He has also bitten me on the face. I play with him with pole toys and he loves to fetch a ball. He has two large cat trees and there are bird feeders outisde the window at one of them for him to watch. He is on his own during the day and he is an indoor cat but I take him outside on a lead occasionally. I don’t know what to do to stop this behaviour. I need advice! My 1yearold cat is an indoor cat , but to keep him chilled I take him outside on his lead everyday and it definitely helps . We even have a log /cat house that he can go in outside and play . It’s a good way to calm him down if he’s in crazy play mode ? HELP – 3 1/2 year old cat just started attacking my son and his friend. since we got him as a kitten, bitten us or became violent until recently. updated and seen by the vet on a regular basis. We were just shocked that he did this. incidents really scared all of us. prevent it from happening again, because I will have no choice but to put him to sleep. smart and I love him so much. We all do including my son. seldom use it, but we just cannot stop from going down there to make him happy. strange when people go down stairs. I can’t be with my son every time he goes downstairs. I don’t even know if this is the issue, but it happened twice downstairs. We just have a TV there and couch, and my office was there until I moved it upstairs when this happened to keep a close eye on him. There is no NEW pets in the area and Pablo is an INSIDE cat. We have no mice in the house also. I would not consider euthanizing Pablo for the behaviors you mentioned. Your children are also older as are their friends so the potential for serious harm is not very high. There are a number of things you can do. I recommend having a behavioral consultation for Pablo so the appropriate time can be spent with you. I can help you through Skype. You can schedule a consultation with me through my website http://www.alanastevenson.com. Re: Pablo’s aggressive behaviors. It is likely your son’s friend set him off – either the sounds of the video games, the sounds and maybe amped up behaviors of your son and his friend etc. which is why Pablo attacked him. It is likely too that Pablo dislikes times where there is too much rowdiness or too much roughhousing and has associated it with the basement. Because these behaviors occurred in the basement, in front of the tv, and when Pablo was on the back of the sofa, any similar situation in that context will cause Pablo to have similar feelings. This is a form of context learning. Some of this seems easily preventable i.e., baby gates keeping Pablo out of the basement unless someone is relaxing, reading, or meditating, keeping Pablo out of the basement completely with gates or by closing the door when your son and/or his friends are there. Another alternative is to bring special wet food, tuna or treats into the basement and if Pablo jumps on the back of the sofa or starts to yowl to act happy or indifferent, open the can of food or tuna and call him upstairs, or put a bowl of food down for him and leave the basement until he calms down. Likewise, when Pablo jumps on the back of the sofa, another family member can be called to remove him or your son can gently remove him and then give him a treat — before Pablo gets too riled up. These are some ways of intervening and preventing Pablo from becoming aggressive as well as getting Pablo into a more positive mindset if he becomes upset. I don’t know the relationship your son has with Pablo or how his friends behave around Pablo. There are certainly many other things you can do too, but we would need to have a behavioral consultation. Hope these tips help. Thank you so much for your reply. The issue with blocking downstairs is that its an open concept, no door going downstairs and his litter box and food is kept downstairs, so its hard to block him out. I really think you are on to something about him being upset or jealous when my son had girlfriend the first time, and his girlfriend the second time. Maybe now, my son just reminds him of those two occasions. Can you email me your rates: [email protected] as I will look into maybe having a consultation if the price is right. Money is definitely not a luxury for us at this moment. Correction, Friend the first time, girlfriend the second time. Sorry. His friend got attacked the first time, and my son got attacked the second time. Unfortunately I am in a similar situation with my 2 year old female cat. She has started attacking my father all of a sudden and if we try to defend him she attacks us too. We recused her as a kitten when she was about 2-3 weeks old. I would like to know how did u deal with Pablo in the end. Your help would be highly appreciated. Hi, my name is tei, I have a 1 1/2 yr old female tabby named Gennaía. And a 3 yr old dog, Sophia. They play really well and love each other so much. But when my boyfriend and I leave out of town, we board our dog at my work( a doggy daycare / hotel) and someone checks in on my kitty. My cat screams and screams! Even if I just take my dog to work with me for the day or take her out to potty, she screams until we come back! Then throughout the day I will just be walking and she attacks my legs, biting me hard and clawing my legs. A few times my boyfriend would have to pull her off my legs. Its terrible! And as soon as we get her off, and I walk away she does it again! We play with her with strings, and pole toys, lasers, balls, the dog plays with her. I’m not sure what to do. My cousin suggested getting a kitten so that there is company for her at all times. I’m just afraid that could back fire and make her worse. If Gennaia gets along with a kitten and vice versa, yes, it could solve the problems entirely. However, if she dislikes the kitten or if the kitten harasses her and she is fearful, the dynamic may change but the changes won’t be wanted or beneficial. However, once you get a kitten, there are things you can do to make the cats like each other and set them up for success. Today i woke up and the old cat was in a corner of a room and when i tried to touch her she attacked me. She was acting just like when the little cat came home. She’s really angry at me and i dont understand why. Could she be sick? Or is she just moody? Can you help me please… oh she’s eating fine btw. It sounds like she is upset or in distress because of the other kitty. It’s important to make note of the animals’ behaviors to each other, what happens and when. Are there locations that your 10 month old cat used to sleep or hang out that are now taken by the smaller cat? Does the smaller cat chase or antagonize your older one? Ten months old is still a very young kitty. You might want to plug in Feliway or Comfort Zone (a cat pheromone) to help ease some of your older cat’s anxieties. Please see some of these articles to help. Integrating Kittens with Older Cats http://www.lifewithcats.tv/?p=47053, Inter-Cat Aggression http://www.lifewithcats.tv/?p=37603, One Kitty Picks on Another http://www.lifewithcats.tv/?p=36051. We found a kitten when it weighed only 12 oz. Its eyes were swollen like huge marbles, vet said it would be blind if we kept her. She tested negative for feline leukemia, so we kept her and had the vet treat her eyes and do shots, and had her fixed. Its now a year later, and for the last few months, she’s been attacking me to no end. Not just me, but I do seem to get it most often. She hides and pounces as we walk by. She zones in on me by listening for my voice, and pounces on me. She has drawn blood on my legs, arms, stomach and face. You know how on TV, raccoons land on peoples faces to attack? Yeah, she did that to me when I was sitting in a recliner. How can I get this behavior to stop? We have tried holding her by the back of neck, we have told her No Bite! We have used a squirt gun when she is running from the attack she just did.we have tried the calming spray, the pheromone collars and diffusers. I don’t want to declaw her because she uses her claws to back down from tall furniture since she can’t see how high up she is. I bought a thunder shirt to try, it should arrive this Friday. ,hoping this helps calm her down. Do you have an opinion on those shirts? And what would you suggest I do to get her to stop attacking? We have another cat in the house, as well as a dog, and she plays too rough with them too. If she hides and pounces, it is most likely play aggression. This is very common in cats who are weaned too early or are the only young cats in the home. Using harsh responses to deter her from attacking – squirt bottles, scruffing, and scolding will only make the behaviors worse. Cats will then attack harder but run away. It is important to diffuse situations when she is in the mode of wanting to attack. Playing with her appropriately and ending play with treats, averting your gaze as she stares at you or is pent up, blinking, and positive redirection such as presenting her food, play, softly talking to her and so on will help get her focus off of ‘attack’ mode. Also, if she is fed small meals or only portions of dry in the morning and evening, instead of free-fed, it can increase aggression in cats. So free-feeding (leaving food out for her to nibble at will) is recommended. I have a 1 1/2 year old cat named Catnip. I have had her since she was 3 months old (she was born a stray and I adopted her from an animal shelter). Originally, she and I lived in a muti-person, multi-animal house but about 9 months ago she and I moved into my new apartment and it has been just the 2 of us. Since then we have had a terrible relationship and I believe a lot of it stems from boredom. She can be a bit aggressive and at times unpredictable in her behavior day to day. From the moment I wake up she is constantly watching my every move ( i literally feel I am being stalked) and often runs to the spot that she thinks I am going to next and plants herself in my path causing me to stop short or trip over her. This causes me extreme anxiety in the morning when I’m getting ready for work because it is nonstop. I have tried to distract her by feeding her but once she has her fill she is right back to stalking/tripping me. Often I have to resort to putting her in a separate room so I can finish getting ready. I do have to mention that this is not the same behavior I have seen with other cats where they are constantly under their caregivers feet, rubbing on their legs etc. It appears to be more of a game to her than an act of affection. she is then home alone for 8 hrs while I am at work. When I return home I immediately feed her and I will play with her for 15 to 30 minutes using various cat toys that she enjoys interacting with. Sometimes, before or after play times, she will sneak up and bite my feet, toes, calf (whatever she can get) which catches me off guard and completely startles me. She will also come rubbing up on me which i interpret as wanting to be petted but after a few strokes she will turn around and bite my hand.Sometimes I react too quickly by shooing her away with my foot, spraying her with water or again, putting her in a separate room. I know these things have only lead her to mistrust me (as much as I do not trust her). I think it is also important to note that very often (several times a day) her tail is thrashing back and forth as though she is constantly in an annoyed state. This is the case in almost every scenario listed above. Every day I shuffle around the house on edge because her mood/behavior can be so unpredictable. There is a lot of tension between us at all times. How can we build our trust in each other again? How can I correct some of her behaviors that seem quite unacceptable? It sounds like your kitty, Catnip, has play aggression and is just pent up and frustrated from being alone all day and maybe at times or all night. She is young and a singleton cat. The ‘wagging’ can be pent up frustration or agitation. Wagging is also seen when kitties want to play or while they are ‘hunting.’ When you play with your cat, especially if you move a toy so that the kitty has to stalk it, you may notice the tail swishing back and forth. Tail swishing is also seen in restless cats. It’s important to be positive with your kitty and to give your cat enough play and social time. How much you feed your cat, how you pick up and touch your cat as well as your voice and daily interactions with your cat can also influence and affect your cat’s behaviors. Scolding, loud voices, kicking, tapping on the noise, blowing in a cat’s face or squirting with water will all make behaviors worse or damage the relationship. For more individualized help, you can contact me at http://www.AlanaStevenson.com for a consultation. These two online articles can provide additional tips. My male 5 year old cat (rescue, adopted at 10 months, had been trapped with it’s mama and litter-mates at 10 weeks. Mom was fixed and returned to her urban home) is very possessive of me, but shares well with my 11 year old female. Both are indoor-outdoor, great hunters, played with daily. The boy cat is very affectionate (head-butts to my forehead, nuzzles my face/neck, loves tummy rubs if done gently, and very strongly given face rubs. He will forcibly rub his face into your hand if the petting isn’t hard enough for his liking.) the other day I was giving him love and he got very into it. Even lifting his back legs up to make room for me to rub his belly, making himself fall over because he forgot he needed the legs to stand. While doing this he got so I to it he was nuzzling my face and asking for tummy rubs, twisting and squirming not knowing which he wanted more/first. Out of the blue he boxed my face and drew quite a bit of blood, but immediately went back to begging for rubs/pets etc. He never stopped purring and chirping while this happened. Did I just overstimulate him? In the years he’s been asking for this attention he’s always told me he’s “done” by switching his tail hard or just walking away. He’s never been aggressive/attacked me. I continued the attention (letting him set the firmness/etc, as always) but felt some anxiety he would do it again. He’s acted totally normal before and after that incident, and never hissed or flattened ears or any other “stop” signals, so I’m a bit confused. What do you think, or suggest? Should I just not let things get so wound up, despite his asking for intense attention? Or was it perhaps a one-off event? It sounds like he could have been overstimulated, especially if he was laying on his side or back and your face was right next to or in front of his while you were leaning over him. Depending on where you were touching his body could also play a factor. Many cats can feel threatened by intense or direct eye-contact (without blinking). If he was overstimulated or wound up and you were nuzzling his face with yours and directly stared at him while doing so, he could have batted you in response. Unless the situation is revisited frequently, I wouldn’t worry about it becoming a pattern. If you are concerned at all you can just softly blink at him and then glance away, or avert your gaze while petting him, especially if your face is near his. You can also use your own judgement and ease or lighten up on petting him if and when he gets too wound up. My cat is male not sure the age but hes a young cat and neutered. he randomly attacks me, he will keep trying to hurt me tell he gets me. im only asking for help because it duse not feel like hes playing it feels like hes trying to hurt me if i dont fix it soon my mom is going to have him put down but he only hurts me. what do i do? There are a number of online articles here that may help. I have listed them below. If you and your mom would like a personal consultation, which it sounds like you would benefit by, you can contact me directly through my website http://www.alanastevenson.com. My girlfriend has a male neutered cat, 10 months old now. Removed from mother early because the owner struck us as a very unreliable and irresponsible. He sometimes would scratch/bite but we always thought it was always more of a playfull expression due to my girlfriend playing with her hands when he was a kitten. The problem is that recently he suddenly bites and scratches her. I always disciplined every behavior I thought was negative as I have had dogs all my life and assured the cat that I was the dominant one. Now he never attacks me but he does attack my girlfriend, with serious intent,and then runs away. We always reacted in a sort of dominant and “aggresive” manner, like squirting and hissing etc to let him know we dont condone that kind of behavior. Now after reading we know this isnt the correct way but it still makes me wonder why he doesnt make me as a target. Now I know for a fact that we play to little with him because of our busy days and our fatigue when we get home but I’m not really sure if this is the cause of the random attacks on my girlfriend. Mainly because even after we play with him, with prey toys as I knew how cats like to play, he still mainly bites her, hard. She lives in a single room studio but we made sure she can get atop the closets by placing a climbing/scratching pole next to it. So I have doubts that the only reason is pent up energy. We havent tried the playing followed by reward method but we will tomorrow so I hope that will at least help. But I still dont know why he only attacks my girlfriend randomly, and ofcourse how we can solve the problem as we are reaching kind of a desperation point. It mainly is such a sweet cat but the incidents occur more frequently. We are going to try and use the methods you described but I would really like some more specific help and/or advice. I hope I was specific enough. Yes, you were quite thorough. There can be a number of variables. One, you might think of increasing vertical territory for him. This means shelves, cat trees, and anything that your kitty can climb unto that is higher up and off the ground. In a studio apartment, you are limited for space. But for a cat, who likes to climb and be up high, there is a lot of feline-friendly usable space in the apartment that is not being utilized. There are a few reasons why he may be attacking only your girlfriend and not you. If you were the disciplinarian or ‘scarier’ — in tone, mannerisms, or more consistently punitive, he might be rather fearful of you when he is in a play/prey mode. Your girlfriend is less threatening, so he attacks her when he’s in the ‘mood,’ but then runs away. Another reason could be because she was more of a caregiver and more affectionate. If she was the one who played with him more than you, wrestled with him, and gave him attention — especially when he acted out, or encouraged it by play wrestling, then he would associate the behaviors with her so she would be the target. He may also be wanting attention at these times. Ten months is very young, so he is still a kitten and very active and energetic. Enriching his environment while you are away is something you may want to do too. How much he eats may also play a factor in his behavior. For more specific ideas and recommendations, you can contact me directly through my website http://www.alanastevenson.com. I do provide video consultations so can consult in the Netherlands. I’ve found quite I few good ideas through the other posts, but I wanted to throw my situation out there in case you have specific advice. My cat 10 year old cat Jake is a moody dude. He’s extremely needy and demanding, although I’ve done quite a bit to give him what he needs. The first problem was he used to wake me up daily at 5am, refusing to quit until he was fed. Then that wasn’t enough, I had to also be awake and up. He would cry and moan, knock things over, bat my face even. Problem now is after all of these attempts, he still is so demanding. I’ve used a spray bottle to stop him, which I see you don’t recommend. Is the damage done there? Just today he was purring a ton after lots of attention and then suddenly hugged my arm and bit me as hard as he could. I am at a loss- I’m tired of making excuses for his horrible behavior and I feel like I’ve put a lot of time and energy into trying to give this grumpy guy a happy lifestyle. I feel like he was pretty well behaved even until maybe 3 years ago. All of his misbehaving is matched by some really sweet and lovable moments, too. Is there such a thing as kitty bi-polar? So- now- I have new 2 roommates moving in at the end of the month- they have a female cat who’s extremely docile. Jake has met other animals, cats and dogs a few times before and has never been aggressive. In fact he couldn’t care less. I’ve read up on how to introduce them, but I’m terrified that his behavior is going to find a new way to get even worse for kitties and new humans alike. Sorry for the overwhelming range of issues. Any suggestions? Are they connected? I’ll put the spray bottle away, but what can I do that isn’t worse somehow? Does the addition of another cat sound like a horrible idea? I recommend a one on one consult. You can contact me through my website http://www.alanastevenson.com. This way information can be tailored specifically for Jake and your situation. You didn’t mention if Jake is free-fed. If he isn’t, he should be. Cats who are fed restricted meals, whether for weight control or because of bag recommendations etc. can become very frantic and obsessive about food. It also increases aggression — generally between kitties, but can intensify or even create ‘play-aggression,’ as well as excessive crying. Cats naturally will nibble or eat 10-20 small ‘mini-meals’ a day. So they genuinely are nibblers. Behaviorally, restricted feeding or rationing meals can cause a lot of stress. With regards to adding other animals to the home, this may help Jake’s behavior. If Jake is bored and antsy, providing he gets along with the other animals, they may be able to entertain each other. I’ve been reading the whole thread in search of a similar situation as mine but I couldn’t find something so I wanted to tell my story and see if there’s some advice I could follow. I’ve got a 2yr old cat named Myc. He lived with me for a year but I got a new job on august in another city and couldn’t find an apartment for both of us so I left him in my parents house. He’s always been a bit aggressive and territorial and when he was a kitten he used to play bitting my hands. or everyone’s ankles. The point is I went home to my parent’s house for Christmas and the moment I got there he started following me everywhere and staring at me and suddenly he just viciously attacked me (as I was taking his food plate to fill it) I had to run for my life and lock myself in the bathroom. He never attacked my parents or brother. But now I’m terrified of him and need to lock him away when i want to get out of the room because if he sees me he attacks. My family is in love with the cat and I really like him too, but spending my holiday week lock up in a room isn’t my idea of fun. Hope you have some advice I could follow, thanks. I do provide one-on-one consultations through my website which is what I recommend at this point. Two things to consider when interacting with Myc are to make his association with you a positive one and to limit your eye-contact or avert your gaze when he stares. Tuna, catnip, other special treats that he adores can be given to him and you can play with him with a special toy or feather pole he likes. You could do this while sitting and/or on the other side of a baby gate if you are nervous. It’s important you don’t walk into his space or directly stare at him especially if he is wary or showing signs of stress in your presence. I’m having a problem with my boyfriend’s cat, “Fluffy”. A bit of backstory: he was found dying on the streets after someone threw him out, and was taken from the pound and nursed back to health by a foster mom. Right now he’s a little over 1.5 years old and probably has feline herpes as he sneezes a lot. He resided at my boyfriend’s for about a month until my boyfriend had to leave town for a long weekend. So we brought him to my apartment, which he seems to love. He also knows me, and seems very happy here. He’s a cuddly Velcro cat that wants to sit on your lap and be with you all the time. Fluffy started sneezing right before my boyfriend brought him over. After a couple of days he wasn’t looking good, so I took him to the vet and he was given an antibiotic shot, Lysine, eye ointment and liquid meds, as well as agreement by the vet that he probably has feline herpes. Needless to say, he doesn’t like getting the meds, but for whatever reason he’s suddenly become very aggressive and over the past two days has been running from me when I have to give them. At first I thought I was overstimulating him as during petting he’d gently nip at me. So I’ve been very careful, but his biting has gotten harder and harder over the past few days. He’s finally feeling better, and has been extremely playful. After we played several times yesterday, he was an absolute angel, purring and cuddling with me the whole night. But tonight he was on my chest and suddenly bit me very hard on the upper arm (which wasn’t even moving). I tried to push him away and he leaned up against my side, refusing to leave. We played later, which I thought would tire him out. After sitting on the bed with me and curling up looking very happy, I reached over to pet him and he tried to bite me. I exclaimed and withdrew my hand. Then he came closer to me and after a couple of minutes I stupidly patted his head and he tried to bite AGAIN. So I stopped all contact and he came over to my lap and bit me. And then sat on my laptop specifically so I had to pay attention and when I tried to get him off jumped over and bit my upper arm again. So by this point, I’m realizing this isn’t simply overstimulation. But what is the problem? • Is he angry? Maybe over the meds? • Is he too full of energy? I don’t think he’s felt this well or gotten so much attention since before he was dumped on the streets. This started after I started giving him Lysine supplements and after he was on antibiotics for a few days. • Is he playing? He’s high energy so we run all over the place and play peek-a-boo and he finds me, but I never play with my hands and it never gets rough. If it does I stop so it discourages him. Mainly we use string. • Is he hunting me? Has running around while we play made him think I’m prey? Thanks in advance for your advice! He’s a wonderful cat and I know we can fix this as long as I understand what’s going on. Otherwise she is a very well-behaved kitten. We have 4 cats of our own. Our friends have 1 cat, 1 dog who get along pretty well. However, when we were at our friends place for dinner, the cat (she’s about 4 years) who never hissed or growled at us before took a dislike to my husband and myself. The cat did not like the sound of my husband’s voice and I’m not sure why she growled at me. She’s an indoor kitty and when our friend held her so I could use the restroom, she scratched her face. Any advise? All of us are baffled. My cat will be very happy, full, just played with…If my leg is barely off the side of the bed I’ll be looking at my laptop and he’ll attack full force and draw blood. Just now my booty was not even hanging off the side and he clawed the heck out of my back side and it hurts and bleeding. I treat him like a king. I’m afraid to hang any legs or arms off the bed. He’ll also attack me full force with my back turned while playing my keyboard quietly. I have scars still healing cuts! Otherwise it’s hard to believe but he is so loving and all over me . He’s 18 months old unneutered and rarely sprays so I can live with him fine. Been just him and I his whole life in and big house. White long haired male with orange eyes and I have friends over maybe once or 2x a month. No changes to his nvironment. What am I doing wrong and BTW neutering is a last resort for me. I want badly to keep him in tact. Thanks for any good tips! My 12 year-old cat is a lap cat who loves to be pet and comes when he is called. His favorite thing to do is get attention and love from me. He has never been aggressive and sleeps with me every night. Last night he slept next to me and got lots of love. After he got up and walked away, I rolled over to go to sleep. Just as I was about to fall asleep he viciously attacked my head with teeth and claws. There was a lot of power behind this attack, leaving deep cuts from teeth and claws in multiple places on my scalp. It was so bad that blood was dripping down my neck from multiple places. It was also a quick attack as I screamed and he ran away after doing the damage. This was a very unnerving experience that has left me afraid of him and confused as he has never shown aggression before. I’m afraid to sleep around him now. If I lock him out of the bedroom he cries and scratches at the door all night. What should I do? What could have caused this attack? I also have another 7 year old cat and a big dog. They all get along; however, occasionally the 2 cats will fight. Please advise! My cat is an indoor/outdoor 2yr. old tabby. He loves my husband and gets along great with our dog. He spends the majority of the day outside playing and hunting mice/lizards, etc, and then comes inside at dinner time where he stays the rest of the night. When we first got him about 6mos ago, he loved to cuddle with me and always let me pet him and pick him up without any issue. Now, he attacks me out of nowhere and even sometimes draws blood. He doesn’t do this to anyone other than me. I’ve tried lightly tapping him on the nose while saying “no”, squirting him with a water bottle, and shooing him away but it only makes it worse. I’ve also tried to grab a toy when it happens and see if that distracts him instead but he still continues to attack me and even backs me into corners. All I want to do is love him and yet all he seems to want is to fight me! I am 100% unwilling to have him de-clawed or to give him up so we need to find a solution because I don’t want this to continue. Maybe he’ll grow out of it? Any tips are appreciated. Thank you! I really need to know what is wrong with my Bombay. He is about a couple months old. He would meow to get petted. When I pet him then stop he starts kneading. When he does that I try to fix my clothes or pet him he would bite my arm or hand. He has never acted this way before. What’s wrong or up with him? I have a 4 year old make cat that was the sweetest thing ever. He purred, played, licked me, slept with me…everything. The last 6 months he is aggressively attacking and biting me to the point of drawing blood. I will just be sitting and he pounces. Nothing has changed it the household for the last 3 years and I have a very set routine that is consistent. I have no ide what is going on but I am ready to get rid of him if I can’t figure out why he is doing this. My home is very quiet so I know it isn’t him being afraid. I have a 13 year old cat that I’ve had since 2 weeks old. She is a sister (I have both cats since that time) She is very loving and loves constant attention. She even sleeps up under my neck when I’m laying down. Lately she has gotten very aggressive toward her “sister cat”. She wants constant attention. If I show any attention to her sister cat, she chases her away. Last evening, I was playing a game on my IPAD. She wanted attention and got aggressive with me when I didn’t pay it to her. She bit me and then swatted at me…and then I got the “stare down”. I yelled at her and she ran. The has always play bite, but this kind of scared me since she broke the skin this time and seemed angrier than normal. Not sure what to do. I love my cat and I’m not sure what may be going thru her little kitty head. Can you help? Denise, you may want to take her to vet and get her checked out. When behavior changes, it can be an indicator of a health issue. My cat is a male, turned 2 years old this year. He is the single cat and pet we have and he has been biting me and drawing blood. My dad usually slaps it with a flip flop when he misbehave (gets on the table when we are about to eat, jumps on the counter, tries to drink from cups…), My mom yells at him when he misbehave though. But he bites only me, I’m the one who usually give him baths, feed him, pet him, let him sleep on my bed. I have noticed that he does that when I am evasive. Meaning that I don’t let him come into my room ( I close the door while he walks towards it while I’m inside) or when I don’t give him food while I’m eating, usually dinner. So, as soon as I have my back turned he runs and “attacks” me by biting me and he did this just a few minutes ago and his canine got in deep enough so I glimpse at my flesh. Does anyone know how I can make him stop doing that without giving in to whatever he wants to do? My cat is completely calm, and then viciously attacked my mother and I. We put her in a dark room for three days and she got better. Then out of nowhere she started yowling, hissing and growling. My mom is saying that the last solution is putting her down, but she’s not usually an aggressive cat. What should we do? Best suggestion is to speak with your vet or a pet advocate. It is possible there is something that needs addressing or is being overlooked and important to seek out a professional for assistance. My daughter’s cat attacks her every time she leaves for a few days. The cat is fine if she just leaves for the day and comes back at night but if she stays away, she always attacks when she comes back. Once she attacks and draws blood, she is over it and won’t attack again. My daughter has tried giving her lots of attention, a little attention, avoiding her, and giving her treats. If my daughter avoids the cat, it may take a day or more for her to attack. It really doesn’t matter what she does, the cat is going to attack her at least once as if to punish her for being gone. There are five of us in the household, two adults, three children. The cat stays far away from everyone but my daughter and one son. When the kids are gone, we are still here so she isn’t alone. You would think she would forget about it after my daughter has been home a while, but she never does. How do we get her to stop attacking? Hi, Cindy. The best suggestion is to speak with your vet or a pet advocate. It is possible there is something that needs addressing or is being overlooked and important to seek out a professional for assistance for both your daughter and the cat. My cat does this all the time. Even in my sleep he’ll playfully bite my side. He’s saying. If you won’t play, I’ll make you play. He’s only two so I’m enjoying his playfulness before he retires to just a lazy old cat.